Mouse anti Human DYNC1LI1 OTI1C5. 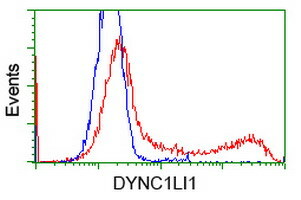 Full length human recombinant protein of human DYNC1LI1 (NP_057225) produced in HEK293T cell. Acts as one of several non-catalytic accessory components of the cytoplasmic dynein 1 complex that are thought to be involved in linking dynein to cargos and to adapter proteins that regulate dynein function. Cytoplasmic dynein 1 acts as a motor for the intracellular retrograde motility of vesicles and organelles along microtubules. May play a role in binding dynein to membranous organelles or chromosomes. Probably involved in the microtubule-dependent transport of pericentrin. Is required for progress throuh the spindle assembly checkpoint. The phosphorylated form appears to be involved in the selective removal of MAD1L1 and MAD1L2 but not BUB1B from kinetochores.